I needed a change from dressmaking. 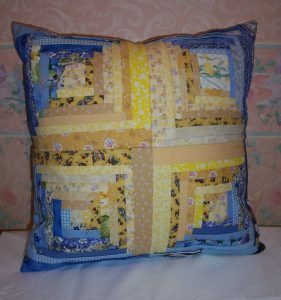 I had a quick look through the stash of UFO projects in the corner of my sewing room and came across two blocks of folded Log Cabin in Blues and Yellows. Just the thing – a small ‘pick-me-up’ before I tackle yet another Raglan-sleeved bodice project. I had plenty of 2½ inch wide strips in the two colourways of Blue and Yellow. Each strip was pressed in half and the folded edge then placed around the outside of the central square. I stitched each strip in place with a ½ inch seam allowance. Further strips were placed just covering the previous row of stitching. The finished blocks were squared off to 8½ inches. As each block had been stitched to a calico backing I thought that to apply another layer of wadding would be too much. 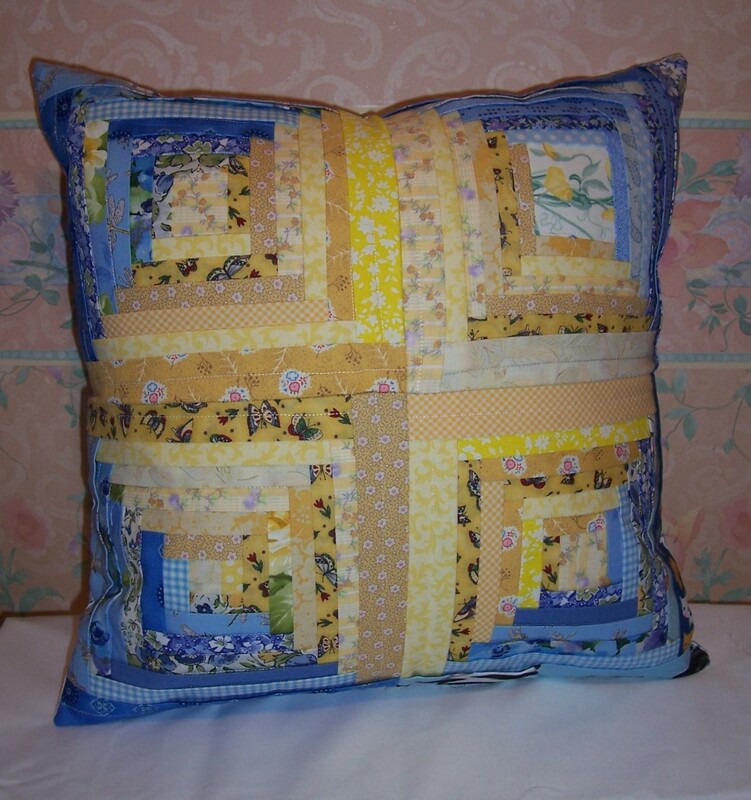 The blocks were stitched together so that the Yellow strips are central with the Blues on the outer edges. I used some donated fabric for the reverse which has a zip closure. The finished cover measures 17 inches and is well-stuffed with a 20 inch polyester-filled cushion pad. A brilliant sunshine in a Blue Sky – now that is cheering!